Summary: From New York Times bestselling author James Rollins comes a novel of boundless imagination and meticulous research, a book that dares to answer a frightening question at the heart of America: Could the founding of the United States be based on a fundamental lie? The shocking truth lies hidden within the ruins of an impossibility, a lost colony of the Americas vanished in time and cursed into oblivion. A place known only as The Devil Colony. Deep in the Rocky Mountains, a gruesome discovery—hundreds of mummified bodies—stirs international attention and fervent controversy. Despite doubts about the bodies' origins, the local Native American Heritage Commission lays claim to the prehistoric remains, along with the strange artifacts found in the same cavern: gold plates inscribed with an unfathomable script. To protect his niece and uncover the truth, Painter will ignite a war among the nation's most powerful intelligence agencies. Yet an even greater threat looms as events in the Rocky Mountains have set in motion a frightening chain reaction, a geological meltdown that threatens the entire western half of the U.S. The novel opens in an Indian reservation where two young men, long time friends, are spending time together searching for Indian artifacts before life takes them in separate directions. They manage to accidentally set off a series of events that may lead to the physical destruction of the planet. When a radical Indian rights group is blamed for the initial explosions, one of their young female members calls her uncle, the Director of Sigma Force, for help. Enter the Sigma Force to save the day. The Sigma Force not only has a race against time to prevent further destruction but must also battle a mysterious demonic enemy organization that has crossed their paths on other occasions. The Sigma Force attacks the problem from multiple angles. One group scientifically analyzes the nanotechnology that seems to be causing the devastation. Another section investigates the tie with the history of the founding of the United States and other groups are in the field fighting the enemy force and physically investigating the findings of the other two groups. The story requires a large cast of characters as the action moves from Washington D.C. to Iceland to Fort Knox to the Rock Mountains. 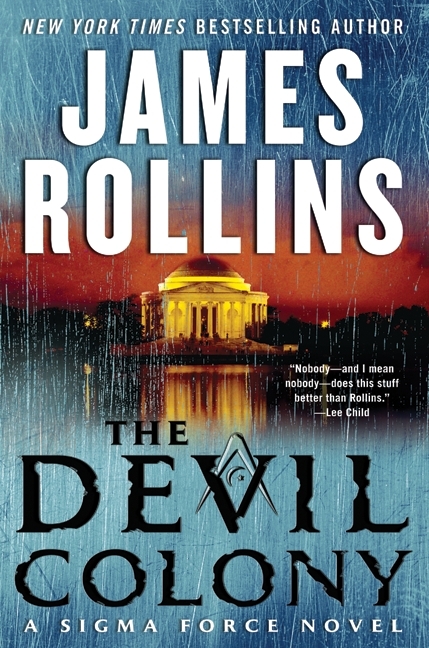 In THE DEVIL COLONY, Rollins combines violence, suspense, superstition, history, and science in a very good action thriller. This is a large 474 page novel that moves quickly with plenty of shooting, explosions and volcanic action. Interestingly, the author includes a section of notes to the reader to separate truth from fiction. I’m not typically into novels that include ultra-sophisticated ancient civilizations and far-fetched conspiracies that would alter our nation’s history but this one held my attention. I recommend this book to anyone who enjoys a good suspense thriller. Thanks to the publisher for sending a copy of this novel and to Booking Pap Pap for another awesome review. Hmmm I'm actually looking for a good, fun book for a vacation coming up. This looks super fun and not at all like the things I've been reading, lately. Oh so glad to read this review. I have this too and was wondering whether to read it, but now I will definitely shift it to my fun-vacation-read pile! This sounds like a well written, larger novel, which I tend to shy away from. I probably wouldn't want to tackle this now with IT read-a-long going on, though. I love Booking Pap Pap's reviews almost as much as I love yours! The book sounds a little complicated, but in a good way! This looks like one I'd like and if your dad is giving it a thumbs up I'll have to add it to my list!